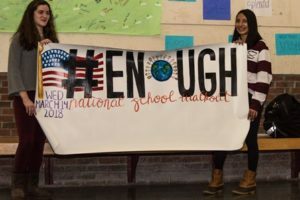 Carolyn McDermott and Meghana Paras hold the #Enough poster that was made by Helen Cai. 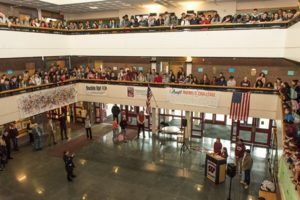 Westborough – Westborough High School students participated this morning in the National School Walkout to honor the 17 students and staff who were shot and killed last month at the Marjory Stoneman Douglas High School in Parkland, Fla. by a 19-year-old man. The WHS students joined other students around the globe who “walked out” of their classes at 10 a.m. for 17 minutes to not only honor those killed in the massacre in Parkland but also as a way to protest gun violence and demand stricter regulations. WHS staff and approximately 1,135 students from all four grades filed into the lobby, filling the hallways, the balconies and the stairwells. 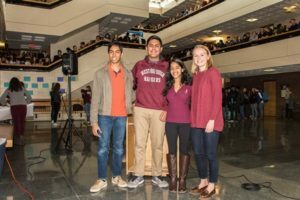 Senior Class President Elizabeth Hopkinson, Junior Class President Omar Siddiqui, Sophomore Class President Rhea Balasubramanian and Freshmen Class President Neil Kale led the students in the walkout. 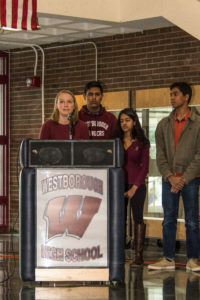 They spoke briefly about why it was important for Westborough to participate in the initiative, how important it is to have their voices heard and how students can get more involved. The students and administrators then honored the 17 that were killed in Parkland by reading off their names and then observed a moment of silence for all victims of gun violence. Prior to the event, Amber Bock, the district’s superintendent, communicated with staff and families, sharing her sorrow regarding the violence in Florida and the plan for WHS students to participate. 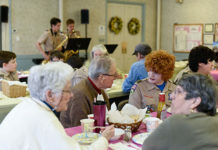 “Our students have been articulate and clear that they wish to participate as a clear sign of solidarity for the Parkland community facing such horrible loss and grief, and to demonstrate the importance of positive civic engagement,” she said in a communication. Other area schools had also planned to participate in the walkout as well. Students and teachers fill the lobby, the balconies and staircases. Class presidents led the students in the National Walkout by reading of the names of the 17 students that lost their lives.